The OZSW PhD council finds it important to point out what good supervising consists of and wants to honour supervisors who set a positive example. Therefore we invented the annual award for best supervisor. The price consists of a trophy with the name of the winner on it and, of course, eternal fame. The PhD council handed out the first annual award for best supervisor in 2013. 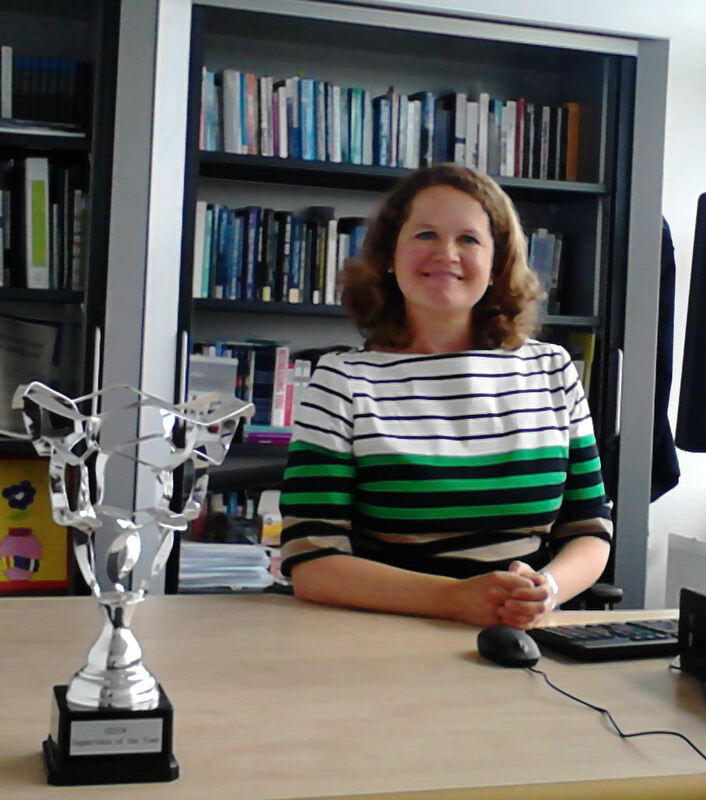 Our laureate for that year was Prof. Sabine Roeser from TU Delft. Below you can find an interview with Sabine that she gave in June 2014. The interview was conducted by Michael Poznic, member of the PhD council. Could you tell us about your academic background? Sabine Roeser: I am Professor of Ethics at Delft University of Technology. My main research interests are in risk and emotion and in ethical intuitionism. I obtained my PhD in 2002 at the Free University, Amsterdam. During my PhD research, I spent two terms abroad: one in the UK at the University of Reading, and the other one in the US at the University of Notre Dame. I hold an M.A. degree in Philosophy (1997) and an M.A. degree in Political Science (1998), both from the University of Amsterdam. I did my B.A. in painting at the Academy of Fine Arts, Maastricht (1994). SR: I like to try to help my PhD students to develop their research ideas, to make the best out of their thoughts. In general, I like to help them to navigate through academia and to support them in several things like setting up a CV, by giving comments about their papers, applying for research grants etc. I try to enhance their learning curve by drawing on my expertise. My main objective is to support them in becoming an independent academic researcher. What do you find most difficult in supervising PhDs? SR: Writing a thesis is a challenging task. PhD students often encounter a lot of obstacles. There are many pitfalls during your time as a graduate student. This is mainly difficult for the student, but it can also be challenging for the supervisor to find the right balance between being critical and supportive at the same time. Should you also discuss private matters, or should that be avoided? SR: When private matters interfere with the work, it’s unavoidable to discuss them, but in general it’s better to avoid them. What would be the ideal relationship between PhD student and supervisor? How close should a supervisor be to his/her PhD student? SR: A relationship should be established in which the student feels safe. Ideally you should have at least two supervisors, a daily one and the official promoter. The supervisors’ first duty is to support the student but they should remain in a critical distance, nonetheless. The supervisors should provide the student with the required tools that help to successfully do the research needed and to finish the PhD study. What do you think is the right frequency of seeing each other? SR: It would be desirable to meet with the daily supervisor weekly and with the promoter at least monthly. I know that reality can be radically different, due to non-standard PhD trajectories. However, as an ideal this should be the optimistic goal for supervising a PhD student. To what extent can you adopt a “one-formula-fits-all” approach to supervising PhDs, or do you need to adapt to the personality of your student? SR: The latter. But certain general safeguards or checkpoints are necessary. There has to be a balance between a tailor-made approach and using more general criteria in the supervision process. What are the most important skills a PhD candidate should develop for writing a thesis? SR: The PhD student should become an independent thinker and scholar. It is crucial to be a self-starter and to find motivation in yourself. Writing a PhD thesis is completely different compared to other kinds of work where you may have other people who tell you what to do. It is very different to other jobs, even if you see the supervisors often and regularly. Therefore, to be self-motivated is a crucial capacity of a PhD candidate. Other skills are time management and discipline. Because the real research has to be done on your own, you need a strong drive. Freedom and independence can be intimidating, you can get overly worried, but you have to overcome these fears. The supervisor can provide support but in the end the PhD student has to master this him- or herself. If you are critical of a student’s work, how do you deal with that? Do you have a special strategy of how to formulate the criticism? SR: The student deserves an honest comment. Honesty doesn’t have to be hurtful. It is very important to help the student with finding the next steps if s/he is stuck in a situation where some advice is needed. It is important to care about the PhD student in the right way. Be supportive, assist them in decision-making, help them where to focus their energies. What are the most important virtues of a supervisor? SR: As a supervisor you have a special responsibility for your PhD students. You want them to make the best out of their research projects. You are more experienced than they are, which means that you can help them to avoid pitfalls by giving them feedback. According to Aristotle, a virtue is a means between two extremes. In these terms, one virtue of a supervisor might be the means between, on the one hand, to be overly protecting and giving no critical feedback and, on the other hand, to be hypercritical and not letting the students explore their own territory. Beyond that, you should be able to share experiences with them, for example anecdotes from your own work, how to deal with critical reviews from a journal, and how to learn from mistakes. What is your attitude towards mistakes and failures in general? SR: I always tell my students to be not overwhelmed by fancy looking CVs. We are always not as successful as we want to be. It is important to share that all of us experience rejections. In the case of supervising, I think it is valuable to show your own vulnerability. In academia, it is more likely that people don’t agree with you than the other way around. So, maybe even more than half of your papers come back after submitting them for the first time. But you have to learn that it’s part of the game. Talking about critical feedback that we receive helps to put things in perspective, but it also helps to improve our work. It is very important to learn from negative criticism. However, your criticism as a supervisor should be constructive and used as a positive incentive.